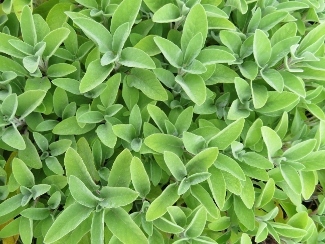 Joy Creek Photo Archive (c) all rights reserved Salvia officinalis 'Berggarten' produce large, rounded gray green leaves that make this a fine culinary sage. It produces fewer flowers than other sage selections. Culinary sages make great additions to the border garden. Cut back at the end of winter to remove woody stems and promote new growth.